Individual Portabello Wellingtons - Vegans Eat What? Vegans Eat What? These Wellingtons make a fantastic celebratory meal for any special occasion. The recipe is less intimidating then it looks and definitely worth the effort! Combine potatoes, olive oil, ¼ cup vegetable stock, and black pepper in a small Pyrex or roasting pan and toss to coat potatoes. Roast in the oven for 40-60 minutes or until tender and golden brown. Add extra vegetable stock if needed and stir occasionally to prevent sticking/burning. Combine 2 Tbsp agave syrup, vanilla and ½ cup vegetable stock in small bowl, stir to combine. Melt 1 tsp. Earth Balance butter to a large sauté pan over medium heat. Add the 8 ounces of carrots and sauce; simmer on medium heat until carrots are cooked through, about 20 minutes. Deglaze the pan with more vegetable stock if needed. Combine ½ cup Marsala wine and 1 cup vegetable stock in small saucepan. Simmer uncovered for 20 minutes. Stir in 1 Tbsp agave syrup and set aside. Reheat on low right before serving and drizzle over Wellingtons. Add spinach, shiitake, crimini mushrooms, shallots, garlic, and tarragon to a food processor and pulse until finely chopped. Add 2 tsp. Earth Balance Butter to a large sauté pan and set over medium heat. Add the mushroom mixture, ¼ cup vegetable stock and sauté for 10 minutes until most of the liquid has evaporated. Season with a pinch of black pepper and set aside to cool. Prepare the 3 carrots and 3 zucchini by first peeling them and then slicing the veggies into ¼ inch wide strips by 4 inch or shorter pieces. Slice the Portobellos into ¼ inch strips no longer than 4 inches. In a large pan over medium high heat, heat ½ cup of water. Add the carrot strips. Cook for 5-8 minutes, then add mushroom and zucchini strips. Add water as required to keep the vegetables cooking. Cook until all the veggies are soft. Remove from heat. Lay one pastry sheet on a flat surface. Cut pastry sheet into 2 equal parts lengthwise. Work with one half sheet at a time, placing ingredients into center third. Divide ingredients into 8ths in order to fill 8 Wellingtons. Fold Tofurky slice in half and place in the center of the pastry sheet. Add carrot, zucchini and mushroom slices. Using a spoon, cover each Tofurky slice, carrot, zucchini and mushrooms with a layer of duxelles. Fold left third of pastry around the filling, then fold right third of pastry over that. Enclose filling entirely and press down lightly with fingers on edges to make sure edges are sealed completely. 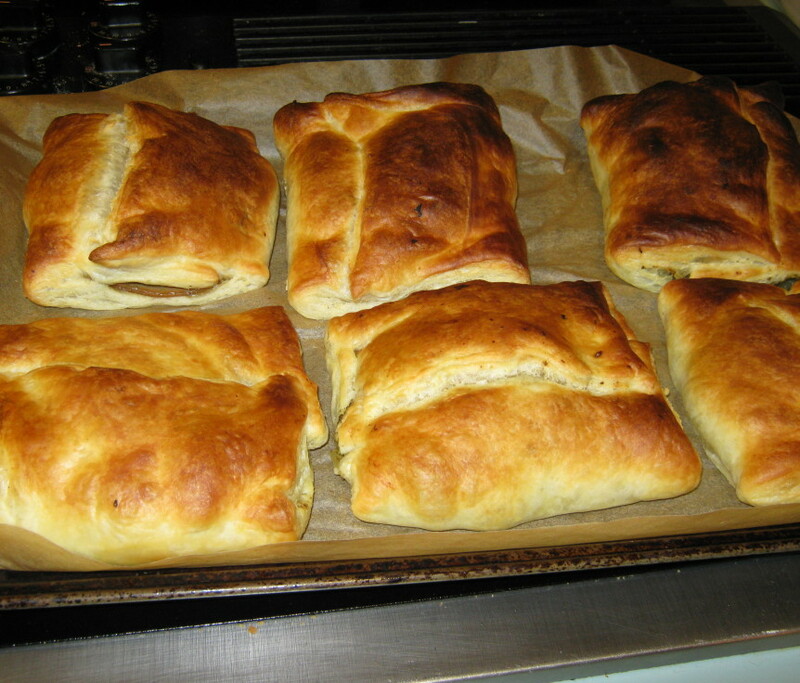 Place Wellington on baking tray lined with parchment paper or non-stick baking mat. Repeat for the second pastry sheet half, and for subsequent pastry sheets. Bake for 15-20 minutes or until pastry is browned. Plate by placing a Wellington, potatoes and carrots on each plate. Drizzle wine sauce over the Wellingtons and serve.